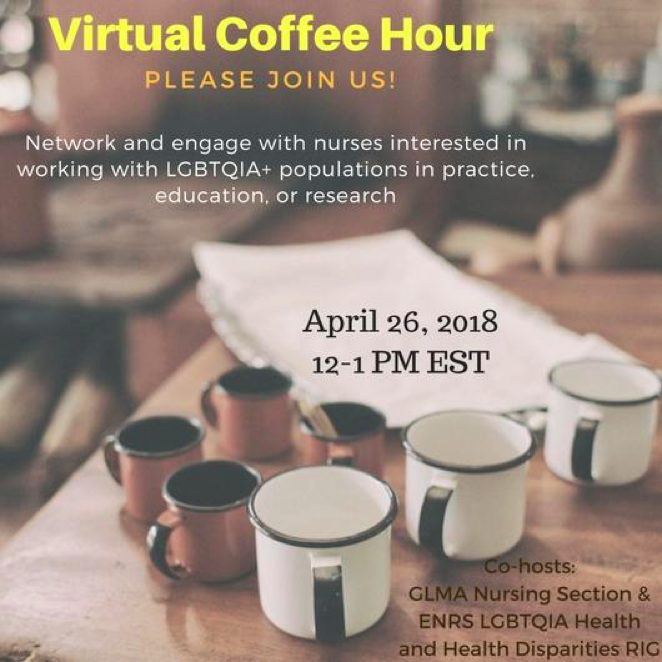 On April 26, 2018 from 12-1pm Eastern time the LGBTQIA Health and Health Disparities RIG of the Eastern Nursing Research Society (ENRS) and Nursing Section of Health Professionals Advancing LGBT Equality (formerly GLMA) are co-hosting a virtual coffee hour for nurses interested in working with LGBTQIA populations in practice, research, and education. We are hoping this will become a monthly, ongoing discussion. The goal is to provide a space for nurses interested in work with LGBTQIA populations in any area to brainstorm together, obtain peer support, share opportunities for engagement and collaboration. The virtual coffee hour will also allow for networking with folks affiliated with both of our groups to increase access to potential collaborators and mentors. This is an informal event. We encourage you to virtually stop by as your schedule allows, whether that is just for a few minutes to say hello or for a longer period of time. For questions or additional information, feel free to contact Caitlin Stover, Chair of the GLMA Nursing Section (cstover@umassd.edu) or the co-chairs of the ENRS LGBTQIA Health and Health Disparities RIG (enrs.lgbt.rig@gmail.com).